I’ve written in the past about how highly Nanci and I recommend The Valley of Vision, the book of Puritan Prayers. It’s a truly amazing God-exalting, Christ-centered compilation of prayers from the Puritans, including a few who lived after the Puritan era but were Puritans in Heart, notably Charles Spurgeon. Some readers will be scared away by the word “Puritan” because of the image of frowning and Pharisaical religious types without a warm relationship with God. In fact, that stereotype is so wide-spread that a seminary professor told me, “The God of the Puritans was remote and impersonal.” My response was to respectfully disagree and to ask him how many of the Puritans he had actually read. Here’s something I wrote in my book Happiness: Consider satirist and journalist H. L. Mencken’s (1880–1956) definition of Puritanism: “the haunting fear that someone, somewhere, may be happy.”  On the contrary, Puritans, judging by their writings, were some of the happiest people who have ever lived! Considerably happier, judging by his writings, than H. L. Mencken. from the world, but only in thee. only to do and suffer what thou dost allot me. I shall not live a life that will satisfy myself. then I shall be of that temper I ought to have. that I can do nothing of myself. for barrenness is my daily affliction and load. with little done to good purpose! H. L. Mencken, A Mencken Chrestomathy (New York: Vintage Books, 1982), 624. Nanci and I love The Valley of Vision, which is a collection of brief and profound Puritan prayers compiled by Arthur Bennett. We find them powerful and penetrating. 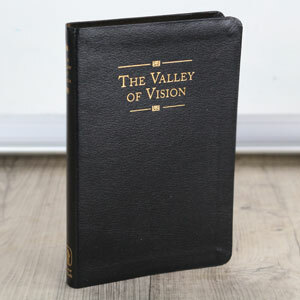 Nanci and I often read The Valley of Vision, or listen to it (Max Maclean does an excellent audio version). These are brief and profound Puritan prayers. We find them powerful and penetrating.